I delivered another webinar class this morning for a few IT managers in Slovenia and Croatia. The topic – Communicate Success With an IT Initiatives Portfolio. 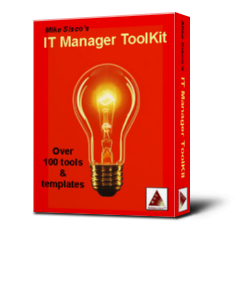 The IT Initiatives Portfolio is one of over 100 IT manager tools and templates in my IT Manager ToolKit. The class only took about 30 minutes and I gave the students a great tool to track and communicate their project initiative performance. CLICK HERE to download the IT Initiatives Portfolio tool now. CLICK HERE to view the 20 Minute IT Manager flash session to learn more about this tool and how to use it. This entry was posted in IT Manager Tools and tagged it initiatives portfolio, it manager tools, project measurements, project performance, project portfolio, track projects. Bookmark the permalink.